LOOSE-LEAF 8 1/2 X 10 INCH BINDER WITH DIVIDERS. As head of the Department of Law, the Attorney General is both the "People's Lawyer" and the State's chief legal officer. The Opinions of the New York State Attorney General are issued in response to requests by state agency officials and local government attorneys. The opinions fall into two broad categories, formal and informal opinions. Formal opinions are those issued to state departments and agencies. They are denominated "formal" because the Attorney General signs them as chief legal officer of the State. Informal opinions are issued to local governments at the request of the attorney for the local government, who is the municipality's chief legal officer. Opinions issued to the municipal attorney are denominated "informal" because it is ultimately the responsibility of the municipal attorney to provide advice to the local government. 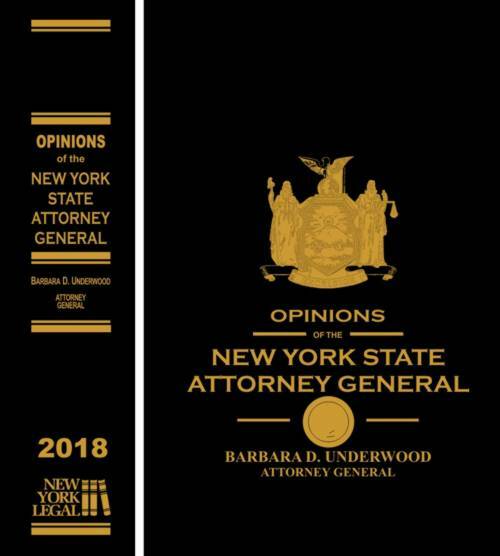 The Opinions of the New York State Attorney General also includes a Subject Index, Statutory Reference Table and Recent Judicial Opinions.